Videos, interactive content, and voice-over audios give life to the new tier of Relief pages, which highlight focal areas of the Alliance’s work and give depth to the action of the Church in response to emergencies. There is a particular focus on providing Churches with the information they need to carry out effective work in relief, and give them the tools they need to support their communities before, during and after an emergency. Best practice is highlighted through easy to access information on the different stages of emergency relief: disaster risk reduction, response and resilience. The action section of the pages are bright and user friendly: more detailed, technical information is available through downloads. The voice-over which starts automatically “reads” the action points from the page. Gender and disabilities are two focal areas for the Alliance’s relief work, and more information on these areas can be seen through the interactive pages. 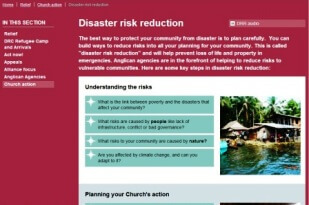 These pages have been designed by the Anglican Alliance to provide accessible information and resource to developing communities and encourage the Church in their disaster response. 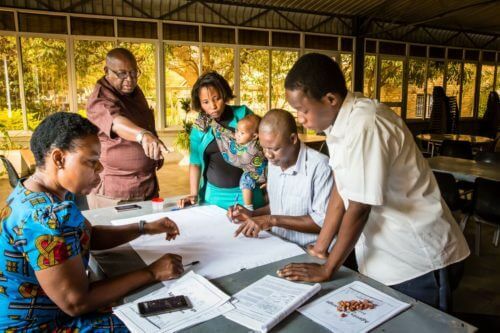 They’re aimed especially at Church communities that are vulnerable to disaster, and which want easy to access information, as well as detailed technical guidance. On the Relief section of the website you can also find tools to help your Church in emergencies and information on how to submit an appeal.